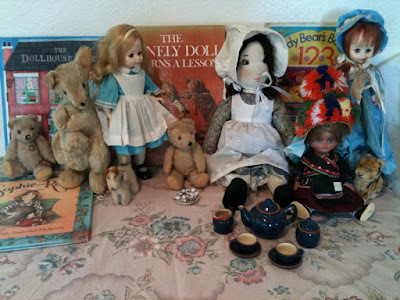 Now that my seven and a half year old niece is becoming interested in her mom's old dollhouse and sewing, I started thinking about all the books about dolls that I also loved and decided to do a week of reviews of the wonderful picture and chapter books that have dolls and/or doll houses as their main characters. Boys, don't feel left out. Most of the stories are universal, ofen adventurous and surprisingly not as pink as you would expect! I am sure that I have overlooked or just don't know about some of the other incredible doll books out there, so I am hoping that you all will write in with enough titles for me to do another whole week of doll stories in the future! For those of you who are interested, the New York Times ran this article back in April Modern Design, in Miniature, is Growing. There are links to some interesting blogs by miniaturists that your kids might get a kick out of.